Canon's medical equipment business is the result of the proprietary optical and image-processing technologies the company has cultivated through decades of innovation in the camera industry. In December 2016, as part of its effort to spark further growth, Canon welcomed Canon Medical Systems Corporation*3 —a major manufacturer of diagnostic imaging systems—into the Canon Group. Soon thereafter, Canon Medical introduced the world first Ultra High-Resolution CT system, an innovative product that achieves remarkably higher resolution than is possible with conventional CT systems. Let's find out how this high-resolution CT system was developed. According to a Canon Medical Systems survey. As of April 2017. The official corporate name (trade name) change of Toshiba Medical Systems Corporation to Canon Medical Systems Corporation on January 4,2018. "CT" stands for "computed tomography," which encompasses X-ray CT, optical CT and ultrasonic CT.
X-ray CT systems comprise of an x-ray tube and detector that rotate around the patient. X-rays are transmitted from the x-ray tube through the patient and the x-rays that emerge from the patient are captured by the detector. 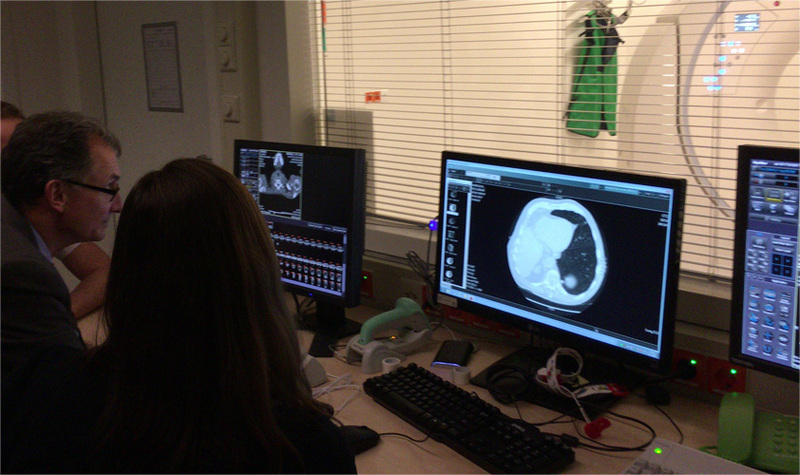 The detector then converts the data into an image of the patients' body. 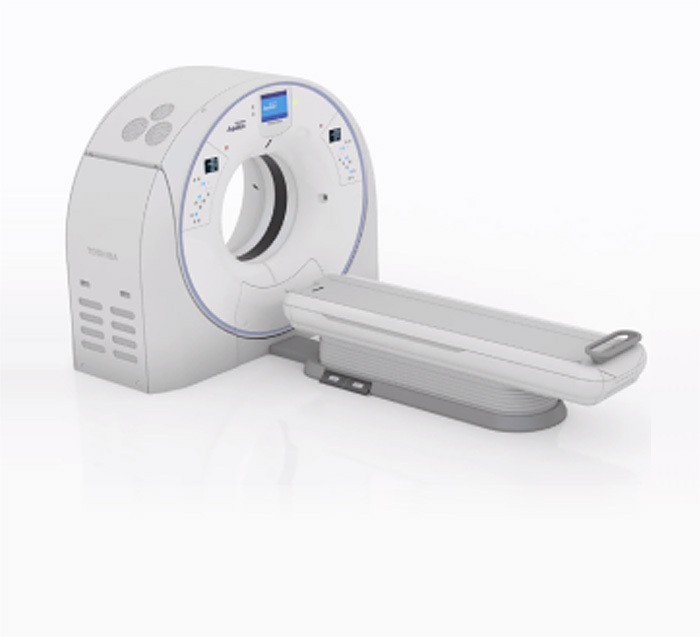 CT Scanners are widely used for diagnosing cancer, aneurysms and other conditions. Canon has been involved in the medical equipment industry for decades. In 1940, immediately after the founding of the company, Canon developed Japan's first indirect X-ray camera. 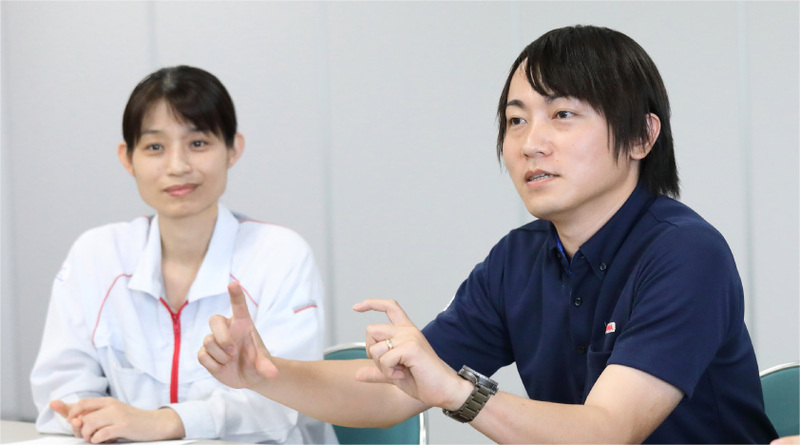 Since then, Canon has taken advantage of the optical and image-processing technologies it has cultivated through camera development to introduce leading-edge medical equipment. These innovations include X-ray digital cameras and optical coherence tomography devices for the diagnosis of retinal diseases. In order to take its Medical Systems Business to the next level, Canon welcomed Canon Medical Systems into the Canon Group in December 2016. 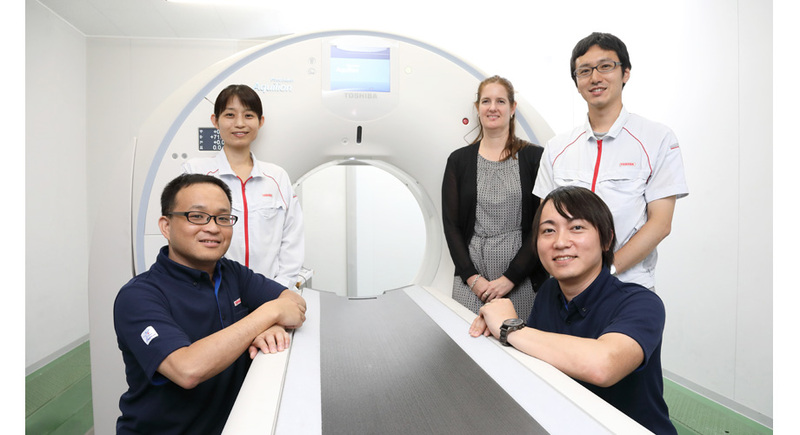 Canon Medical Systems is involved in the sales and servicing of medical equipment, primarily X-ray CT diagnosis systems ("CT systems") and magnetic resonance imaging (MRI) systems in more than 140 countries and regions. 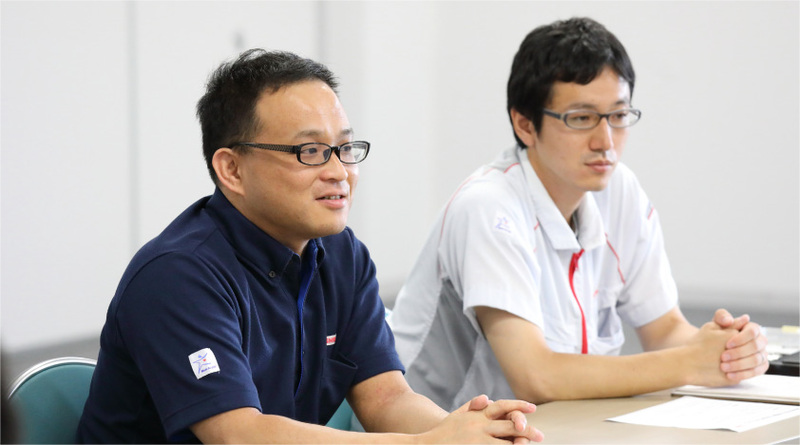 The company boasts the top share of the Japanese market for CT systems and ranks third in the global market. 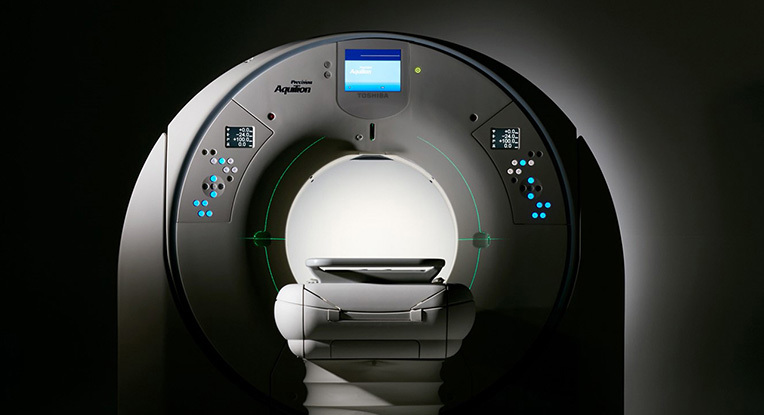 The company's Aquilion Precision Ultra High-Resolution CT system is a world first, providing remarkably higher resolution than conventional systems. 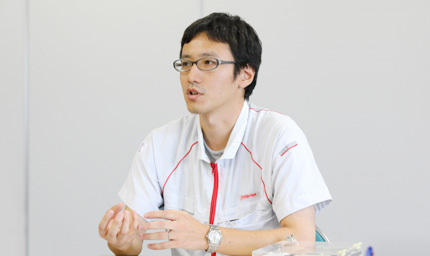 After joining the company in the year 2000, Mr. Shindo was involved in mechanical design. 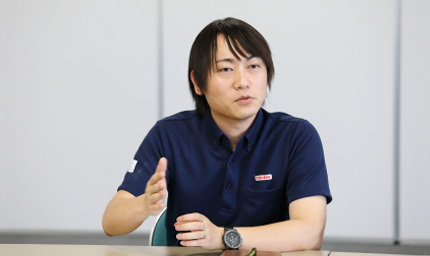 Since 2015, he has been in charge of system development. A believer in the concept of continuous improvement, he is committed to always taking an innovative approach when encountering new challenges. I hear that the Aquilion Precision provides remarkably higher resolution than conventional CT systems. When did you start development on this system? We started basic research on the Aquilion Precision in 2001, working in collaboration with the National Cancer Center Japan. First, let me outline the technical trends in CT system development. With a CT system, X-rays from the system's X-ray tube unit ("X-ray tube") pass through the human body and are picked up by the X-ray detector on the other side. The X-ray tube and X-ray detector rotate around the patient and record the X-ray attenuation level resulting from absorption into the body. This is the basic principle of tomographic imaging systems. With the earliest CT systems, one tomographic image was created per revolution of the X-ray tube and detector. 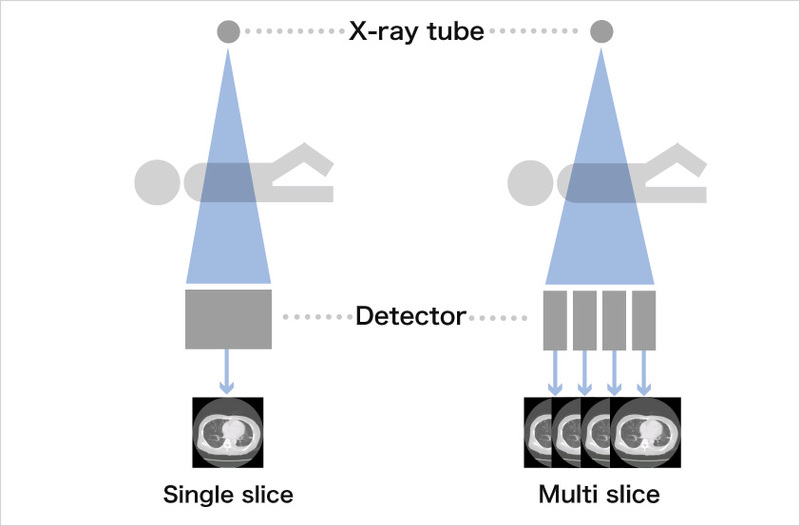 Later, as the number of detector rows increased, a trend emerged toward multi-slice systems, which are capable of capturing several images per rotation. 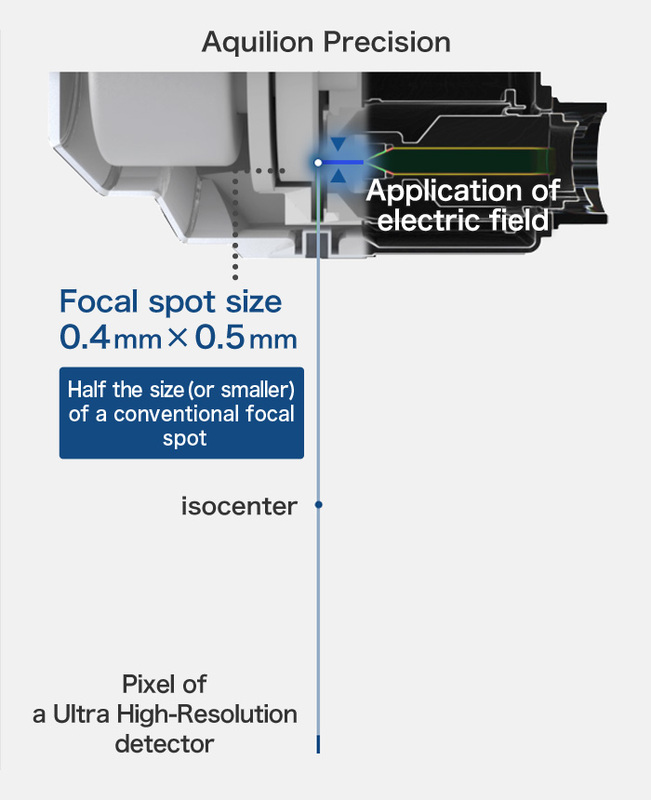 With the Aquilion ONE™ system introduced in 2007, 640 images at 0.5mm slice width could be reconstructed per rotation covering 16-cm of the body each rotation. Generally, current CT systems utilize this multi-slice image approach to reconstruct 3-dimensional volume images. The CT is used to image the human body, which of course cannot remain completely still. For example, the heart is always beating. Therefore, one focus of technological development has been to achieve the highest possible scanning speed, in a manner similar to a using high shutter speed on a camera. Another important focus of development has been to reduce radiation dose—an issue those involved in the diagnosis and treatment of disease have become increasingly aware of. 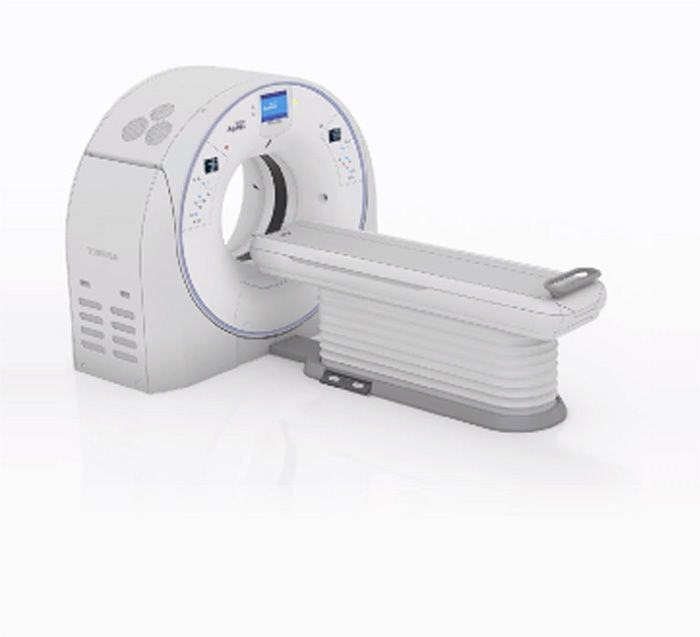 In fact, one differentiating aspect of CT systems is that they are capable of obtaining a diagnostic image with a small amount of radiation dose. Over the past several decades, the trend in CT technology has been to focus on 3-D imaging, high-speed scanning and reduced radiation dose. Every CT system manufacturer is intent on achieving improvements in these areas. It should be noted, however, that little change has been seen in the image data itself. What does the term "image data" refer to? The term "image data" refers to, for example, the images that enable a small feature to be visualized and the information that can be obtained about pathology. In terms of higher resolution, a CT resolution of 0.35 mm was achieved in 1986. Since that time, however, there has been no improvement in resolution. 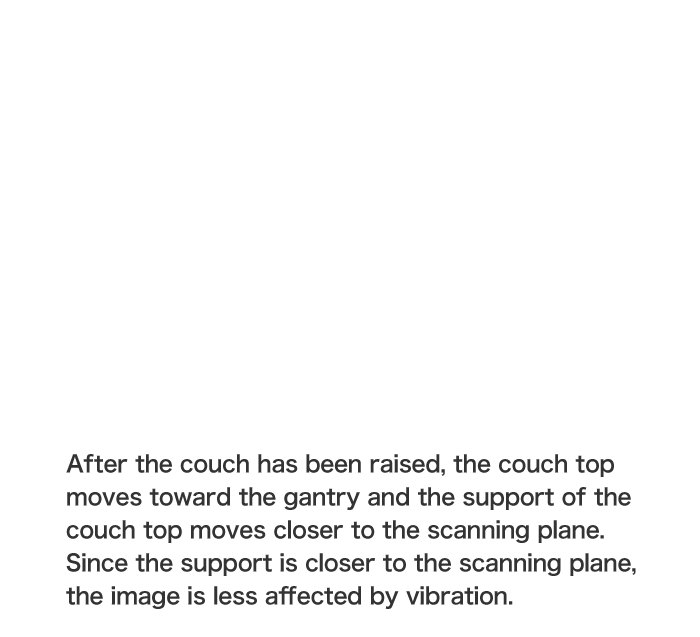 In other words, the profile of an object measuring 0.35 mm square or smaller could not be clearly seen. 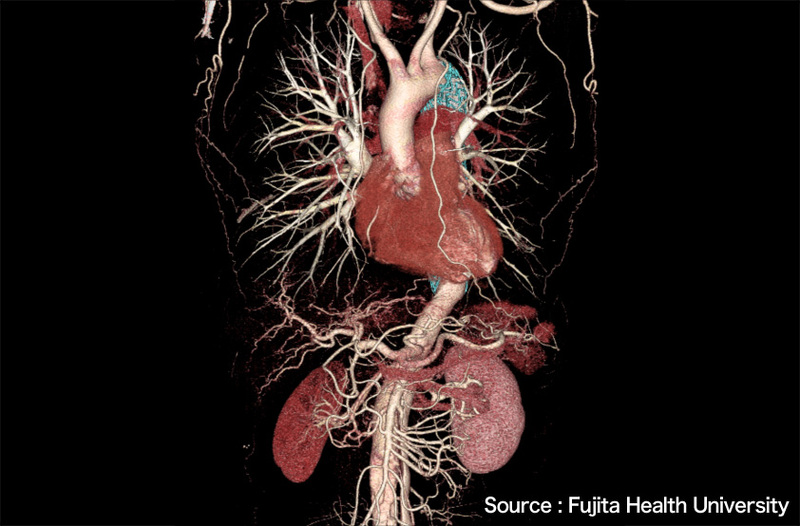 In 2001, a project was launched to develop a new high-resolution CT system that would revolutionize the captured image data. First, we started developing a system to visualize specimens of internal organs. In 2003, we developed a rotating gantry CT system for small targets, and in 2005, we developed a CT system applicable to the human body. However, because of commercialization issues, we had difficulty putting the system on the market. What were the problems you encountered regarding commercialization? The new system could not be used in the same manner as a conventional CT system. What's more, radiation dose increased. Generally, when a system uses smaller detector elements in order to obtain higher resolution, an increase in radiation dose cannot be avoided. This is because the overall signal per element must remain the same, so as the detector elements become smaller, X-ray radiation has to be increased. 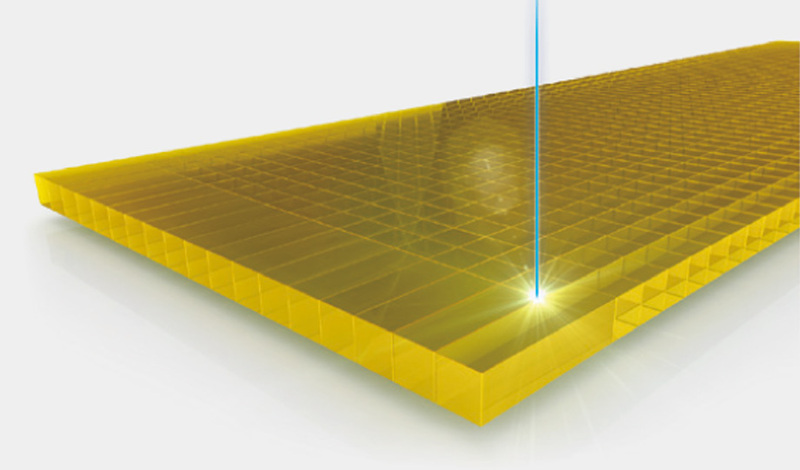 Later, through such developments as increasing the amount of signal the detectors can capture, suppressing circuit noise and adopting the latest dose reduction technology, we finally managed to create a commercially viable 0.25 mm x 160-row Ultra High-Resolution multi-slice CT system that achieves a resolution of 0.15 mm. The X-ray detector is an essential part of a CT system. The quest for higher resolution requires extraordinary technology for machining ceramic material into components measuring less than half the size of conventional components. 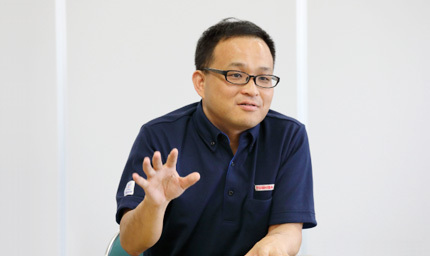 Since joining Canon Medical in 2008, Mr. Kanemaru has been involved in the development of detector units. 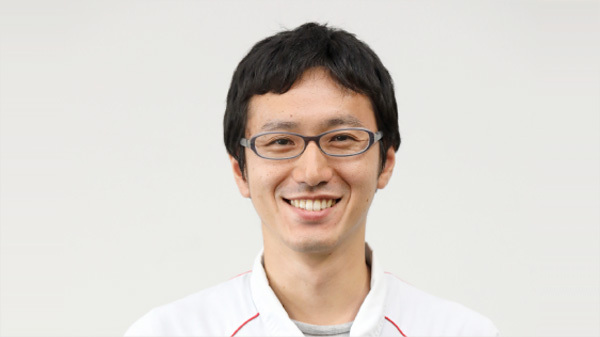 While carrying out this work, Mr. Kanemaru manages to maintain a curiosity and inquisitiveness toward technology. The X-ray detector and X-ray tube are particularly important aspects of the effort to increase resolution. With this in mind, what technical solutions were applied to the X-ray detector? The most important point is probably improving machining accuracy for the pixels that make up the detector. The detector consists of ceramic layer on a semiconductor sensor, or photodiode. It is not so difficult to miniaturize the photodiode thanks to semiconductor technology. However, machining the ceramic layer is extremely difficult. Some very advanced technology is required to achieve pixels a quarter of the size of those found in conventional CT systems. Is a laser cutter used for the machining process? The ceramic layer is cut with a blade. I suppose it's difficult to imagine the detector. Would you like to see some samples? The lower image shows a detector comprising one pixel in a conventional 0.5-mm slice width. Our machining technology for obtaining a 0.5-mm slice was developed in 1998. Even today, other manufacturers have a standard slice width of 0.625 mm. The upper image shows the detector used in the Aquilion Precision. The slice width is 0.25 mm, and the pixel size is one quarter that of conventional pixels. In both samples, the letters beneath the detector are legible, however, beneath the conventional detector, the profile of each letter is notched like the typeface used in an old computer. With the sample from the Aquilion Precision unit, the letters are more distinct. We were able to achieve the current level of precision through gradual improvements over time. In 2014, the machining technology required for the detector was established, reaching a level that enabled us to put it to practical use in an actual product. In addition to improving the machining technology, we encountered problems with capturing signals with less radiation and suppressing noise from the detector. At first we tried to build on conventional technology, but we were unable to achieve the required noise reduction. So, at a certain point, we undertook a review of all principal components of the detector, including the scintillator*4 and photodiode*5. In order to increase luminance, we employed a new material for the scintillator. And to increase the signal level and reduce electric noise, we improved the photodiode. Furthermore, our proprietary manufacturing technology was crucial to mount these parts with high precision. To achieve high resolution, the X-rays must be emitted from an extremely small focal spot. This breakthrough was achieved by applying a proprietary technology that uses an electric field*6 to adjust the size of the focal spot. 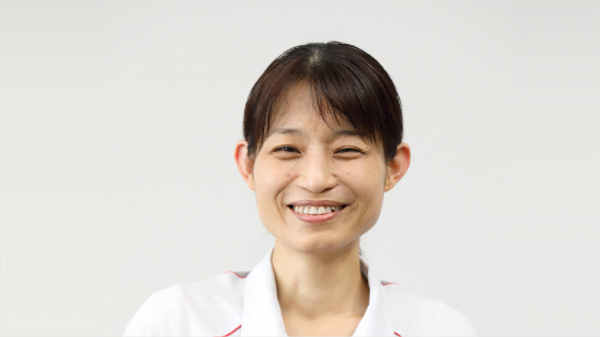 Since joining the company in 1997, Ms. Harada has been engaged in the development of X-ray tube units. 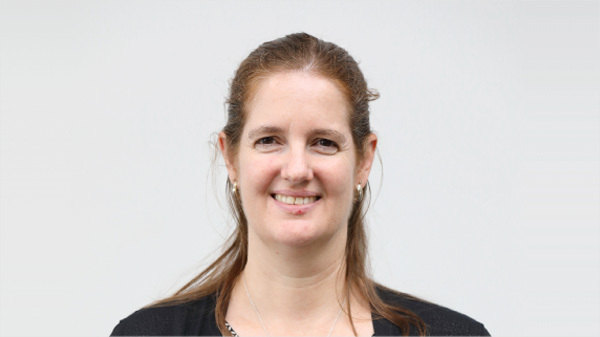 She strives to develop outstanding products by always maintaining close communications with X-ray tube manufacturers. 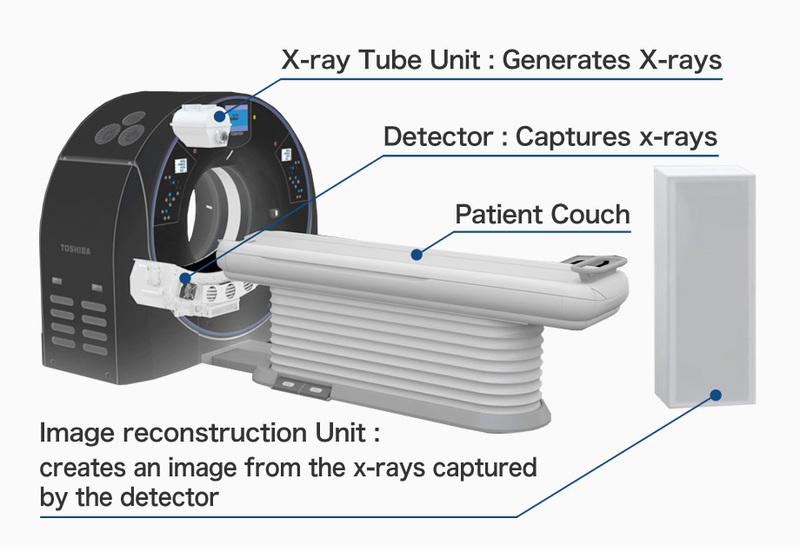 The X-ray tube, which emits the X-rays, is another factor in achieving high resolution. What improvements did you make to the X-ray tube? I was involved in the development of X-ray tubes with small focal spot, working together with Toshiba Electron Tubes & Devices Co., Ltd., a Group company. The focal spot was reduced to about half the size of that found in a conventional CT system, but it proved difficult to commercialize this product. Although it was possible to manufacture a prototype, the yield from the mass production line still needed improvement. Generally, it is preferable to have a perfectly square focal spot for an X-ray tube utilized in a CT system. However, during the development phase, we found it difficult to form a perfectly square focal spot at such a small size. Were you able to achieve any technical breakthroughs? Apart from this project, I've been involved in developing elemental technology used to control the size of the focal spot. With a conventional X-ray tube, the size of the focal spot is fixed and cannot be changed after assembly. With our new technology, however, the electron beam emitted to the target for X-ray generation is subjected to an electric field. This provides focus control that narrows the electron beam. Applying an electric field in this way is like creating an "electrical lens" in the X-ray tube that reduces the size of the focal spot. Technology for adjusting the size of the focal spot is already being used in industrial products. Just when this technology was becoming practical for CT systems, development of the Aquilion Precision was brought into the discussion. We decided to incorporate this technology in the Aquilion Precision in order to realize our goal of a small focal spot. Is this technology—changing the focal spot size by applying an electric field—common among CT systems? Among our products, only the Aquilion Precision incorporates this technology. 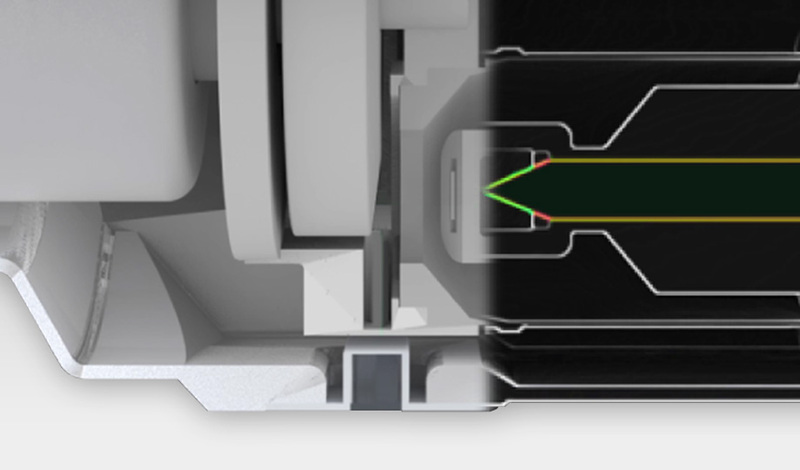 Generally, CT products have two focal spot sizes that are achieved by changing the X-ray output. However, Aquilion Precision is the first product to offer a freely adjustable focal spot size. Imagine how, when sunlight is focused at a single point through a magnifying glass, the beam of light can become so hot that it can set paper alight. When the beam is focused onto a small focal spot, that focal spot becomes extremely hot because the energy is concentrated on a single point. Similarly with an X-ray, as the focal spot becomes smaller, the anode in the x-ray tube becomes very hot and the X-ray output must be reduced. However, in this state, the X-ray passing through the human body lacks sufficient strength, resulting in image noise. Overcoming this problem proved difficult, but once we could control the focal spot size, it became possible to control the power of the X-ray, thus allowing us to put this technology to practical use. Reducing radiation dose is an important issue for CT systems. How does this system reduce the radiation dose to the patient? In order to reduce radiation dose, we must develop low-dose imaging technologies. For example, most photo cameras cannot capture clear images if the ambient light is insufficient. In the same manner, CT systems can capture clear images with a high X-ray output, but this increases the radiation dose to the patient. Clearly, it is essential that the system be able to efficiently convert even a small amount of X-rays into electrical signals. By improving the sensitivity of the detector, we can obtain a strong signal with a smaller amount of X-ray radiation. We can also reduce radiation exposure by suppressing electrical noise. What's more, the system incorporates means for receiving X-ray energy selectively; for example, a filter is employed to select a specific wavelength of X-ray that is easily absorbed into the human body. Does the system incorporate any mechanical features to enhance resolution? 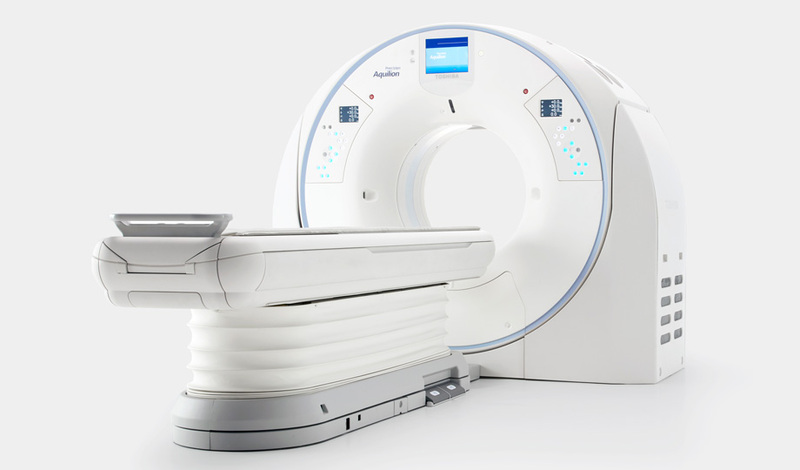 The Aquilion Precision uses an advanced platform design for the scanner body, and the couch that the patient lies on has been completely overhauled. 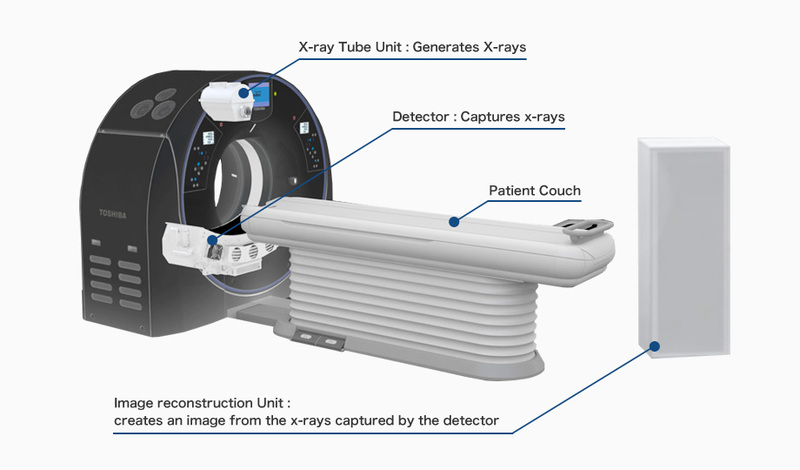 During operation of a conventional CT system, the upper part of the couch slides toward the gantry, or ring-shaped scanner. The couch top then slides further away from its support as it enters the scanning plane. This movement, along with the patient's weight, can contribute to significant vibration and position error. 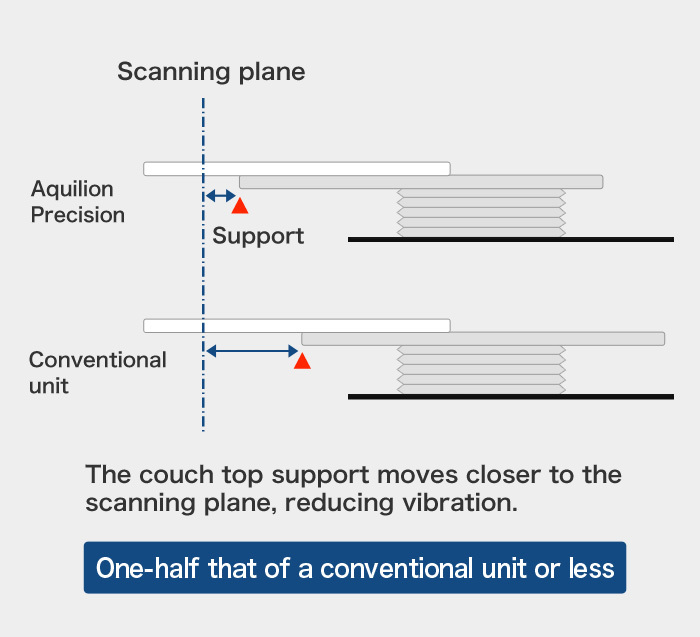 To counteract this, the Aquilion Precision is equipped with an additional mechanism to move the couch top support closer to the scanning plane, thus minimizing vibration and position error. With this mechanism, the amplitude of the vibration can be reduced to half that of a conventional system, or even less. Image-processing technology is contributing significantly to improved performance. What are your thoughts on this? 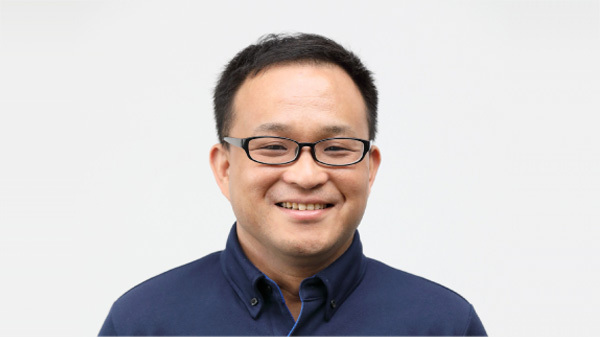 Since joining the company in 2009, Mr. Goto has been in charge of system development, and his primary responsibility has been the design of high-resolution imaging technology for new products. He is always mindful of his role as a medical engineer, and that the systems he develops will be employed on the front lines of medicine. It's a simple calculation: reducing the pixel size to one-fourth the conventional size results in a four-fold increase in the amount of information to be processed. Therefore, the system must be designed to incorporate an optimal up-to-date processor. If the image reconstruction time were to greatly exceed that of a conventional CT system, the number of patients a hospital could scan would be less, resulting in reduced efficiency. Preventing this requires that we do our utmost to maintain the conventional reconstruction time. Additionally, we have changed two principal units—the X-ray detector and the X-ray tube—resulting in image quality that is completely different from a conventional system. To deal with this change, the parameters must be adjusted. What's more, we have developed technologies to reduce radiation dose, including AIDR 3D*7 and FIRST*8. As resolution increases, so too does image noise. Therefore, the system fully utilizes these low-dose technologies to capture high-resolution images while suppressing noise, thus obtaining the best possible image quality. Noise reduction technology that applies a statistical noise model and a scanner model with collected projection data. With AIDR 3D, the system achieves a noise reduction of up to 50% and a radiation-dose reduction of up to 75%. Click here for details. A method of creating images through repetition of the back projection method, which creates an image from projection data obtained by scanning, and the forward projection method, which creates projection data from the obtained image, while employing various models including a system model and statistical noise model. Click here for details. Doctors were pleasantly surprised by the Ultra High-Resolution images obtained by the Aquilion Precision. Features that were difficult to visualize with conventional CT systems are now clearly visible. The Aquilion Precision is clearly ushering in a new era in CT diagnosis. 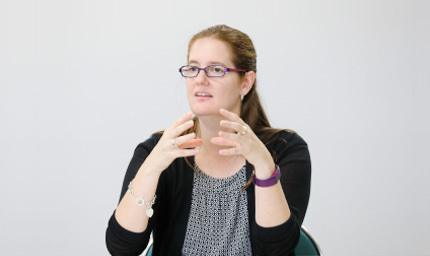 Since joining the company in 2005, Ms. Steveson has been working as an application specialist who creates connections between the development division and doctors in the field. Her motto is, "One team, one product, together we can do better." How did doctors react to this system during development? 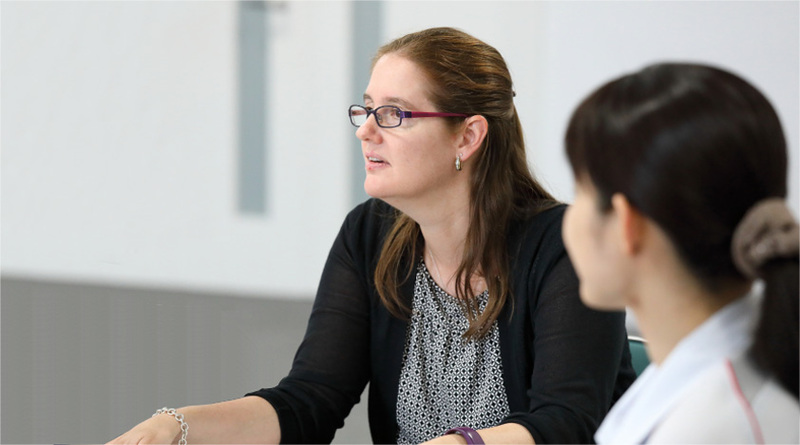 I've served as an application specialist making connections between the development division and doctors in hospitals. 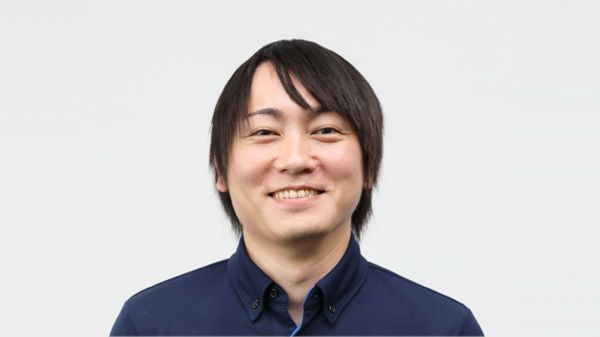 I was responsible for evaluation testing in the U.S.A. and the Netherlands. At the National Institutes of Health in the U.S.A., conventional CT systems and clinical research prototypes were compared side-by-side. The doctors were surprised at the remarkable difference in image quality between them. This system was evaluated with high expectations for clinical application because of the possibility that doctors could detect certain types of cancer that are usually difficult to detect at an early stage. Doctors' comments and suggestions obtained during trial runs are reflected in the development phase. The Aquilion Precision obtains images of much higher resolution than is possible with conventional systems. For this reason, it has been adopted by medical facilities in Japan for diagnostic use. Could you outline your future development plans? As we have done so far, we intend to leverage our expertise and obtain a wider range of images at one time, increase scanning speed and reduce radiation dose. However, a major challenge is determining how to handle and utilize the unprecedented Ultra High-Resolution images obtained by the Aquilion Precision for diagnostic purposes. From the perspective of the layman, one would assume that Ultra High-Resolution CT images could solve many diagnostic problems. But it's not that simple, is it? I've had the opportunity to talk with doctors in the hospital, but they are not accustomed to dealing with such high-resolution images when they first use an Aquilion Precision for radiologic interpretations*9. Every day, doctors see many patients and view a vast number of images. 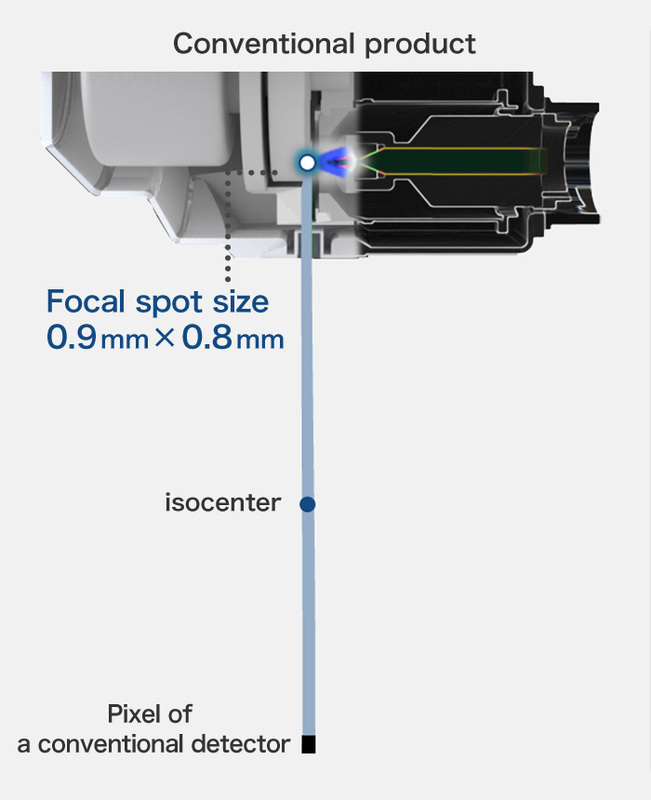 The Aquilion Precision increases the volume of information available because of its 0.15-mm resolution. This makes it possible to see features that are simply not visible with conventional CT systems. As a result, some doctors might find that their workload has increased compared to their experience with a conventional scanner. 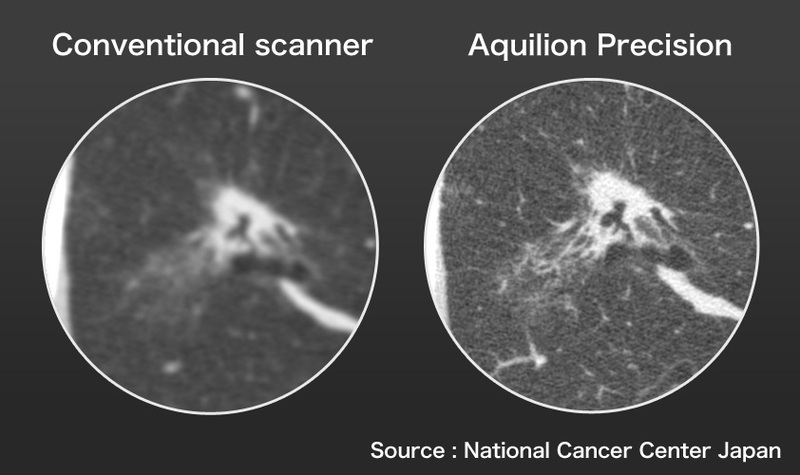 On the other hand, just as some doctors have indicated regarding their experience with the Aquilion Precision the images produced are much sharper than conventional scanners enabling them to make faster diagnostic decisions. What's more, the future adoption of artificial intelligence software may hold the potential to suggest diseases for consideration, thus greatly assisting doctors with their observations and diagnoses. In December 2016, Canon Medical Systems joined the Canon Group. What synergies can we expect to see in CT technology? In terms of tracking a moving target, CT technology might be similar to camera technology. It would be interesting if the system could correct blurring by detecting motion. If the system could recognize the patient's face in order to eliminate patient recognition errors, while also entering such information as the patient's height and weight data through automatic recognition, procedures would be greatly simplified. With the current detector, the X-ray is converted into light and received as a signal. I think it would be interesting if Canon's optical and manufacturing technologies could be applied to this process. What I expect we can gain with Canon technologies are an improved user interface and image post-processing. For example, I envision a system that could enable automatic diagnosis by using deep learning technology and the like while also reducing the operator's workload. In the technology industry, it is almost expected that the performance of equipment improves year by year. However, once "quantitative change" exceeds a certain level, it tends to become "qualitative change." This perfectly encapsulates what has been achieved with the Ultra High-Resolution Aquilion Precision CT system. Because it realizes twice the image resolution of conventional systems, this system provides clear images that can reveal physical changes caused by disease that would not be visible in images obtained with a conventional system. This heralds a new age in CT technology. There is no doubt that these Ultra High-Resolution CT images will contribute to improved diagnoses in the future. Although Ultra High-Resolution image data provides us with incredibly valuable information, it can be difficult to process. This raises several questions: How can handling of this data be simplified by software and optical technology? What synergies will be realized with the optical and image-processing technologies Canon has cultivated and its new partner, a leader in diagnostic imaging systems? And how will this change the field of medicine? With high expectations, we eagerly await the answers to these questions. 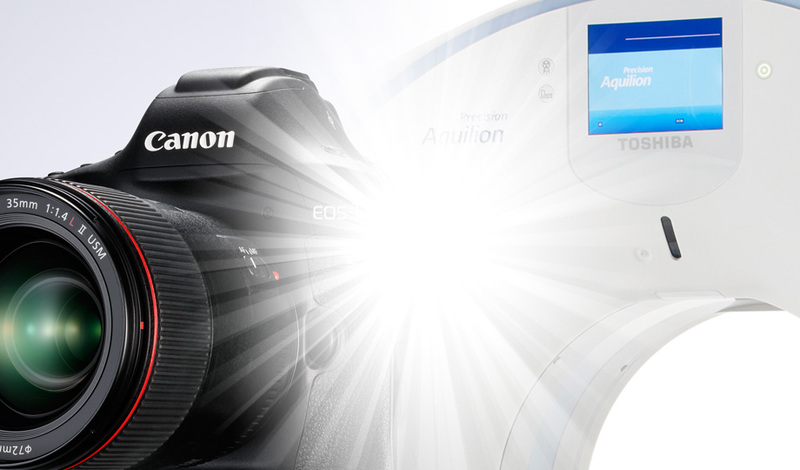 Aquilion, Aquilion ONE and Aquilion Precision are trademarks of Canon Medical Systems Corporation.